I deeply regret to inform you of the death of Ing. Agr. Ricardo Melgar occurred on February 3, 2019 who was struggling with a severe illness. I had the opportunity to work with Ricardo during my first years as an agronomist, and without a doubt, he was the person who helped me the most in difficult times for the recent graduates and gave me a very interesting and modern look on the world of fertilizers. it helped considerably not only in those times, but it also shaped my early education and vocation for the subject of soil fertility and crop fertilization. Over time, our professional bond continued in different projects, and became an active friendship that lasted until his last days. As for Ricardo’s professional background, it is not an easy task to summarize it, nor is it intended to do so in this obituary. A brief review: he graduated as an Agricultural Engineer from the Universidad Nacional del Nordeste in 1978. He subsequently obtained a Ph.D. in Soil Sciences from the University of North Carolina in 1989, being one of the few agronomists at that time Doctorate level in Argentina. More recently, during 2001-2003 he studied at the Master in Agribusiness of the Faculty of Agronomy of the University of Buenos Aires. At the time of his death Ricardo had been working for 34 years at INTA, his last position was as Principal Investigator. Beyond his position at INTA, Ricardo was considered the main reference in the Argentine fertilizer industry and market by organizations such as IFA, IPI, Fluid Fertilizer Foundation, among others. For several of these organizations he developed consulting and advisory tasks. Ricardo was also a great maker of technical publications related to fertilizers, especially books, for which he maintained a permanent enthusiasm until his last days, enthusiasm that I ended up adopting. I will deeply miss Ricardo and take advantage of these brief and incomplete lines about his professional biography to thank him deeply for all the times he helped me professionally and also to accompany his wife Mercedes and their children in this painful moment. I am with you for what you need. Summary: The differences observed between 2016 and 2017 indicate environment and soil type play critical roles for N/S management in cotton. Sandier soils will be selected during the 2018 growing season to ascertain the effect of soil type on N/S management in the upper Southeast coastal plain. Through fluid nitrogen-sulfur fertilizer formulationsThrough fluid nitrogen-sulfur fertilizer formulations. .
1. Evaluate granular and fluid nitrogen (N) sources with varying sulfur (S) application rates on in-season NDVI measurements, petiole and leaf S status during the first week of bloom, and lint yield of cotton in the upper southeast coastal plain. 2. Determine the effect of high N:S ratios in side-dress fluid N sources at varying N application rates on NDVI, petiole and leaf N:S ratios, and lint yield in the upper southeast coastal plain. Experimental Design. Three trials were implemented across the upper southeast coastal plain cotton production region in 2016. The trial locations were Tidewater Agricultural Research Center in Suffolk, VA (Suffolk), Everett Farms in Southhampton County, VA (SHC), and the Peanut Belt Research Station in Lewiston NC (LEW). The study was a randomized complete lock design with four replications of each treatment. Treatments were applied to four row plots measuring 35 ft. in length and 12 ft. wide. Prior to planting a composite soil sample was taken at 0-6, 6-12, 12-24, and 2436 inch depths and analyzed for soil ammonium and nitrate concentrations using a 2M potassium chloride (KCl) extraction procedure. All other nutrients, except N and S, were applied based on soil test recommendations and/or extension recommendations for North Carolina and Virginia cotton production. There were a total of seventeen fertilizer treatments (Table 1). The primary fluid N sources were urea ammonium nitrate solutions (28-32% UAN) and granular urea. A bulk blend of granular urea and ammonium sulfate (AMS) was applied at 100 pounds of N per acre with S rates ranging from 0 to 30 pounds S per acre (Treatments 2-5). The granular fertilizers were spread uniformly over the plot area by hand. The total N application rates for the fluid NS sources were 60, 100, and 140 lbs. N per acre (Treatments 6-17). Nitrogen was applied in split applications with 20 pounds N per acre applied at planting and the remaining N applied at the 1st square stage of development. To achieve the varying rations of N:S solutions, UAN was mixed with ammonium thiosulfate (ATS) (120-026S). Ammonium thiosulfate was chosen for its high S concentration over AMS solutions (8-0-0-9S). The four ratios applied were S,8:1,4:1, and 2.66:1. 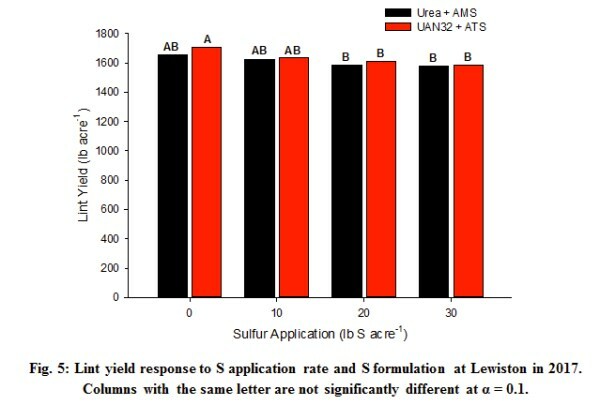 The analyses of each fluid N-S side-dress fertilizer material were 32-0-0, 24-0-0-3S, 24-0-0-6S, representing fluid fertilizer formulations currently feasible using UAN and ATS solutions (Tom Fairweather, personal communication). The fluid fertilizers were applied using pressurized carbon dioxide system mounted on a four (36-inch) row applicator outfitted with coulters/fertilizer injection knives approximately 6 inches to the side of the row. All N sources were treated with the urease inhibitor N-(n-butyl) thiophosphoric triamide (NBPT),to minimize any ammonia volatilization from surface applied urea based fertilizers. Preplant Soil Nitrate and Ammonium Sampling. Prior to planting, soil samples were taken from each site. Six to ten cores were taken per location. Samples were taken at 0-6, 6-12, 12-24, and 2436 inch increments to be analyzed for ammonium and nitrate. The soils were air-dried and extracted with 2M KCl. Ammonium and nitrate concentrations from each sampling depth were determined using colormetric analysis using a Lachat Quickchem 8500 (Lachat Instrument, Denver, CO). Normalized Difference Vegetative Index Measurements. Remote sensing measurements were initiated one week after side-dress N applications using a Greenseeker handheld crop sensor (Trimble Navigation Limited, Sunnyvale, CA). The Greenseeker measures the normalized difference vegetative index (NDVI), a measurement of the reflected near infrared and red light from the crop canopy. Greenseeker measurements were taken for 5 weeks after N application. Normalized difference vegetative index measurements were taken on the second row of the plot and the sensor height was 36 inches above the canopy. Normalized difference vegetative index measurements were taken on the second row of the plot and the sensor height was 36 inches above the canopy. Reflectance measurements, like NDVI, have been correlated to chlorophyll content and N status in multiple crops. Given that S deficiencies occur in the upper crop canopy, NDVI may also be sensitive to variations in S status in crops. Tissue and Petiole Sampling during Bloom. 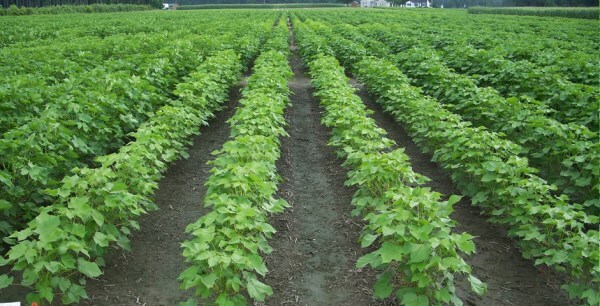 During first week of bloom twenty-four cotton petioles and leaves were sampled from the first and fourth rows of each plot. 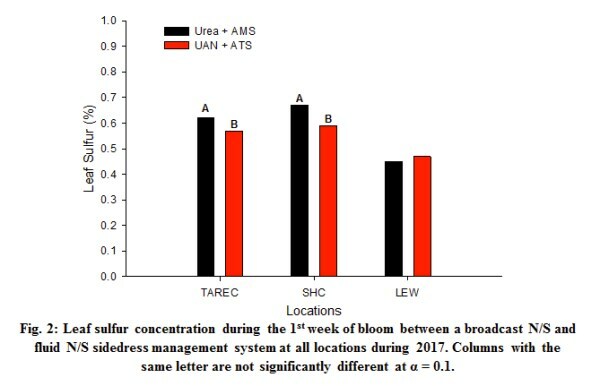 Research in Virginia has shown that petiole and leaf nutrient concentrations have a higher correlation to yield during the first week of bloom than later sampling intervals. The petiole and leaf were sampled from the fourth mature leaf below the apical meristem (bud) down the main stem. Cotton petioles and leaves were separated immediately to ensure accuracy of nutrient concentrations. Petioles and leaves were dried at 65 degrees C and ground to pass 1 mm and 0.5 mm sieve sizes for petioles and leaves, respectively. The petioles were analyzed for nitrate-N, phosphorus (P), potassium (K), and sulfur (S) and leaf tissue underwent a complete nutrient analysis at Water’s Agricultural Laboratory (Camilla, GA). Defoliation and Lint Yield. Defoliation timing of cotton varies, depending on the growing season and development of the crop. The cotton during this trial was defoliated when 40-60% of the bolls were opened. This timing was based upon treatments with a total N application rate of 100 pounds N per acre. High N application rate can delay maturity in cotton. However, given that the upper southeast coastal plain falls within the northern latitudes of the U.S., cotton production, any delay in maturity can be detrimental to the crop yield. This range in percentage of open bolls will allow for some adjustment based on the development of the crop during the study, but falls within the recommendations for defoliating cotton in Virginia and North Carolina (Edmisten, 2012; Wilson 2015). The cotton from the center two rows was harvested with a Case International two row cotton picker. Seed cotton was weighted from each plot, then a onepound subsample was taken and ginned to determine lint turnout. Lint yield will be calculated from the percent turn out from the ginning process and seed cotton weights from the harvested rows. The ginned lint was sent to the USDA cotton quality lab in South Carolina for lint quality analysis. The lint was analyzed using a High-Volume Instrument (HVI), where length (stable), strength, micronaire, color, and leaf (trash) grade were determined. Statistical Analysis. The statistical analysis of the experiment included a regression analysis and analysis of variance (ANOVA), conducted using SAS 9.2 (SAS Institute, 2009). The data set was separated in order to conduct the appropriate statistical analyses, based on treatment design, to determine the effect of S fertility on NDLVI, petiole and tissue S concentrations, and lint yield quality. The first dataset compared granular NS fertilizers to fluid N/S fertilizers with varying S application rates at a fixed N rate of 100 pounds N per acre. The treatment design for the first dataset was a 2X4 factorial design with two N/S fertilizer sources and four S rates. 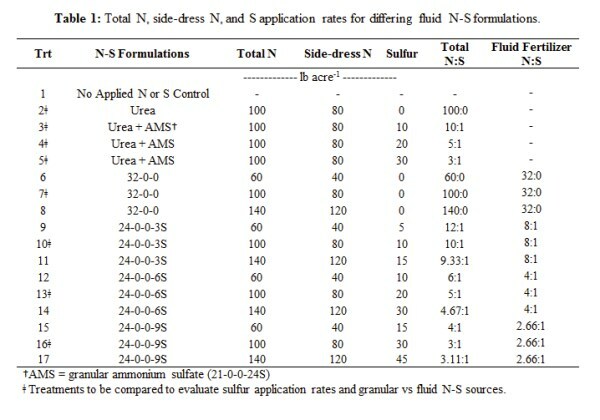 The N/S fertilizer sources were blends/ formula-tions of granular urea+AMS and fluid UAN+ATS solutions. The S rates were 0, 10, 20, and 30 pounds S per acre for each fertilizer source. Fisher’s LSD mean separation procedure was used to detect treatment differences at: a = 0.05 level of significance. Regression analyses were used to describe the response of each dependent variable to increasing S application rates. The second dataset compared the interaction of N rate and S rate using N-S fluid fertilizers with varying N:S ratios. The treatment design for the second dataset was a 3X4 factorial design with three total N rates and four N:S fluid fertilizers. The three total N application rates were 60, 100, and 140 pounds N per acre and the four N:S fluid ratios were 32:0, 8:1 4:1 and 2.66:1. Fisher LSD mean separation procedure was used to detect treatment differences at a = 0.05 level of significance. General comments. The 2017 growing season had more favorable weather for cotton production than 2016, particularly during the boll opening /defoliation period of the growing season. Yields in Virginia averaged over 1,100 pounds of lint per acre and were the second highest production year in Virginia’s history. Yields across all locations were high with the highest yields reported at the Southampton location in 2017. There was no substantial period when rainfall or soil moisture was limiting at any location. Due to seed availability of Phytogen 499 WRF, the variety planted across all locations in 2017 was Phytogen 450 W3FE. This variety was chosen due to its similar maturity and performance in the 2016 Virginia cotton official variety trials. However, this variety was variable in its performance across locations and its environment. Large differences were found in plant available nitrogen (PAN) (soil ammonium-N + nitrate-N) in the top 36 inches of soil at each location (Table 2). The Lewiston location had the highest PAN among the sites with 12.3 ppm ammonium N and 15.2 ppm nitrate N, which would be equivalent to 55 lbs. N per acre of PAN prior to planting at this site. This is over 50% of the recommended N rate for cotton in Virginia. Southampton had the lowest PAN of any location with an equivalent N rate of 14 lbs. N per acre prior to planting. 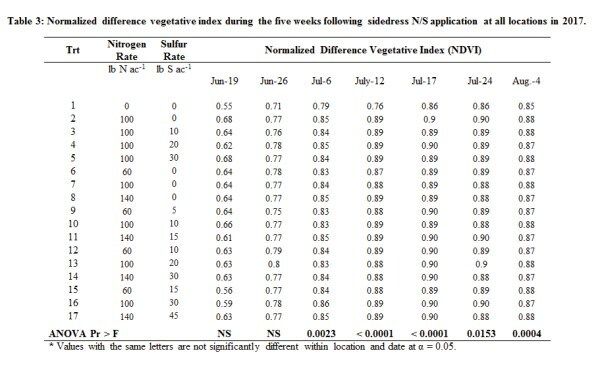 Normalized Difference Vegetative Index (NDVI). Normalized difference vegetative index at TAREC was very similar to that measured in 2016. Differences in NDVI were more were more prevalent early in the growing season, differences becoming limited later in the growing season (Table 3). Once the cotton closed the row middles the biomass, with a handheld sensor, saturated NDVI, thus only the unfertilized control was significantly different from the fertilized treatments. Visually, some greenness differences were observed visually, however, the handheld sensor and/or NDVI was not able to differentiate the visual differences. A sensor mount on a UAV might be a better option for measuring reflectance on cotton, as the higher altitude will prevent sensor saturation due to a large canopy near to the sensor. Granular vs. Fluid N/S Formulations. Tissue N and S concentrations varied in response to N/S formulation and S application rate among locations. The TAREC location was the only location where petiole nitrate-N concentrations were significantly higher with the fluid N/S formulations compared to the broadcast formulations with 10,262 and 4,737 ppm nitrate–N, respectively. However, petiole and leaf S concentrations were significantly higher when a broadcast system was used at two of the three locations (Figures 1 and 2). 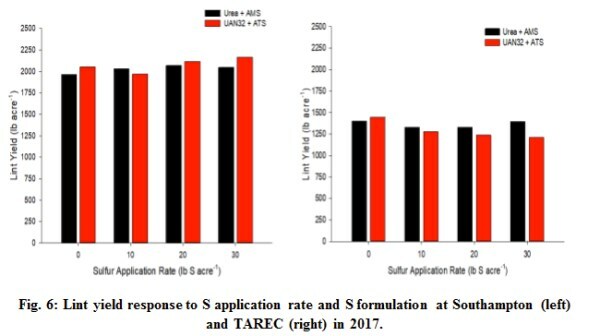 When evaluating S application rate across S fertilizer formulations there was no interaction between formulation or application rate. Petiole and leaf S concentrations increased with increasing S application rates in a quadratic function for all locations (Figures 3 and 4). Petiole S concentrations ranged from 400 to 600 ppm S for the 0 lb S per acre rates over 900 to 1,400 ppm S at the 30 lbs. S per acre rate (Figure 3). For leaf tissue S concentrations, the 0 lb S per acre rate ranged from 0.3 to 0.4 to 0.5% and 0.8% for Lewiston, TAREC, and Southampton, respectively (Figure 4). There were no samples taken from any location where leaf S concentrations fell below current deficiency threshold of 0.25% (Figure 4). When N application rate was kept constant, the petiole nitrate-N: petiole S and leaf N: leaf S rations decreased as S application increased, regardless of N/S formulation (data not shown). Nitrogen to S ratios for petiole and leaf tissue were not a good predictor of lint yield in 2017 as they were in 2016. This may be due to the limited response to application of N/S during 2017 and no ratio exceeding 30:1 for petiole nitrate-N:petiole S as in 2016 when a yield penalty was observed. More data are needed to develop N:S ratios for cotton during bloom for petiole and leaf tissue samples. Lewiston was the only location in 2017 where differences among S application rates and NS formulations were observed (Figure 5). 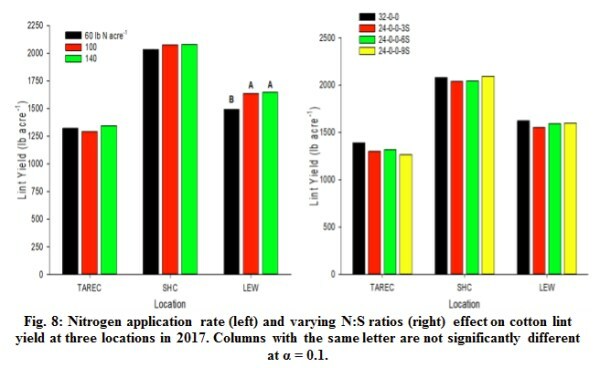 However, the 0 and 10 pound S application rates produced the highest lint yields during 2017, and lint yield decreased slightly with increasing application rates (Figure 5). 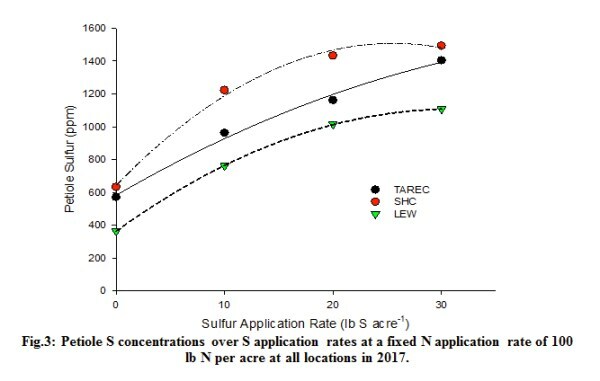 The fluid N/S formulation with 0lb S per acre application rate produced the highest yields at Lewiston and was significantly higher than the 20 and 30 lb S application rates regardless of formulation (Figure 5). 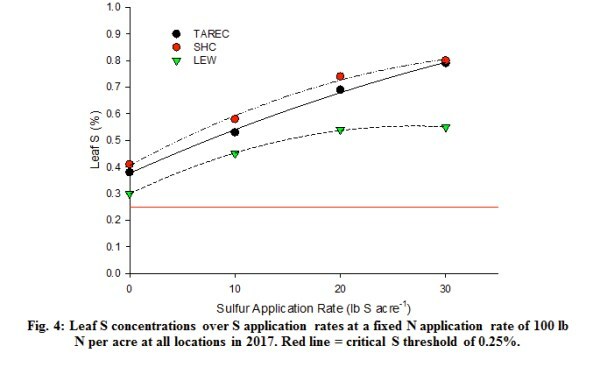 At the Southhampton and TAREC locations no differences in S application and N/S formulations were observed for lint yield (Figure 6). However, at TAREC yields followed a similar trend with deceasing lint yields with increasing S application rates. The Southhampton location increased slightly with increasing S application rates and was also the highest yielding site in 2017 (Figure 6). The limited response to S application rates may be due to soil type and leached S in a subsoil level that is accessible. Since all soil samples were saved during the study, they will be sent out for analysis of S concentrations down to depth. NS Combinations at Various N Rates. The second half of the study focuses on the use of fluid N/S formulation with differing N/S ratios to supply adequate S at lower N application rates. 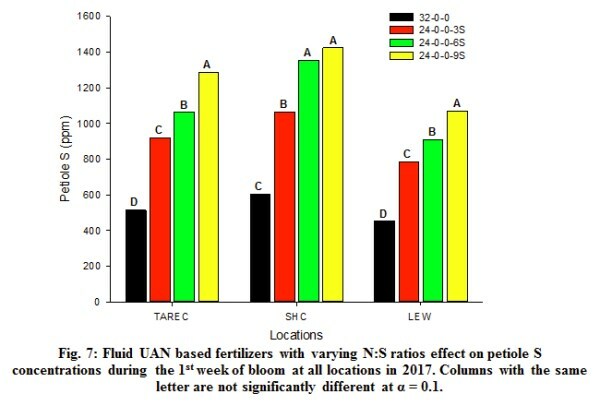 All three locations were very responsive to fluid N/S formulations with increasing petiole S (Figure 7) and leaf S concentrations (data not shown) as the S analysis of the fluid N/S fertilizer increased. 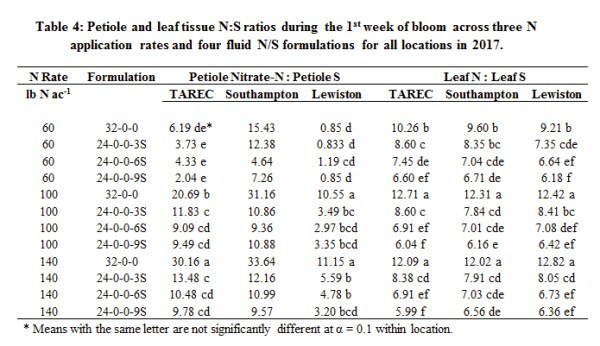 Petiole nitrate-N: Petiole S and leaf N:leaf S ratios were significantly different at two out of three locations for the petiole ratio and three out of three for the leaf ratio (Table 4). The petiole N:S ratio was very low at 60 lbs N per acre application rate, and overall, lower than the other locations. Leaf N:S ratios were consistent across locations in 2017, which may be indicative that leaf N:S would be a more consistent predictor of S status. Lower N application rates and higher S analysis of the fertilizer resulted in lower petiole and leaf N:S ratios across all locations (Table 4). The increase in leaf and petiole S concentrations indicate that cotton was taking up the added S, however no lint yield responses were observed by increasing the S percentage in the fertilizer blend. Lewiston was the only location in 2017 where ling yields differed among the three N application rates (Figure 8). The 100 lbs. N per acre rate maximized yields at the Lewiston location, whereas no response to N application rate was observed at TAREC from 60-140 lbs. N per acre (Figure 8). There was a slight increase in lint yields at the Southhampton location, though this increase was not statistically significant (Figure 8). 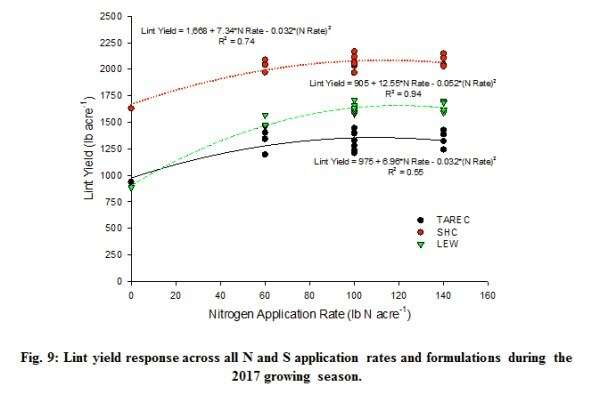 When lint yield was regressed over all N application rates and N/S combinations during 2017, the optimum N rate was found to be 100 lbs N per acre (Figure 9). However, each location had unique N response curves and yield levels during the 2017 growing season. 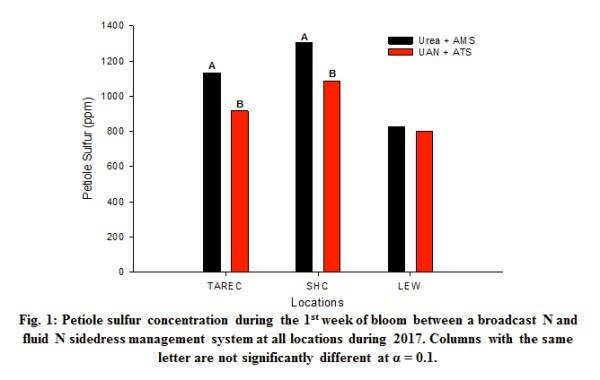 There was no response to increasing the S content of fluid UAN solutions during the study in 2017. All locations in 2016 had a slight increase in lint yield from 32% UAN to 24-0-0-3S solutions. Soil types at each location during 2017 were heavier in texture and may have had S contributions from the subsoil where leached S may be retained. All soil samples were from the past six site years. This will allow inferences to be made about S contributions from the subsoil and predict when applying S will be needed to achieve optimum lint yields in cotton. Overall, the 2017 growing season was marked by favorable weather conditions and high lint yields across locations. The cotton variety selected for 2017 showed increased variability in lint yields across environments, though lint yields were satisfactory. Also, this variety did not perform well in the 2017 Virginia cotton variety testing program, thus in 2018 another variety may be selected that is a more consistent high yielding variety across environments. Tissue S concentrations were very responsive to N and S application rates during 2017. The broadcast (dry) N/S management system produced higher petiole and leaf S concentrations compared to fluid N/S sources. Nitrogen rate was the most limiting nutrient at each location during the study and lint yields were maximized at 100 lbs. N per acre across locations, regardless of yield potential. No response to S was observed during 2017. This may be due to varietal S usage or the mining of S from heavier textured subsoil where S has been leached from sandy loam surface horizons. Soil samples taken for PAN analysis will be sent off to determine S availability in lower soil horizons. The differences observed between 2016 and 2017 indicate environment and soil type play critical roles for N/S management in cotton. Sandier soils will be selected during the 2018 growing season to ascertain the effect of soil type on N/S management in the upper Southeast coastal plain. Dr.W. Hunter Frame is Field /Crops Agronomist, Department of Crop and Soil Environmental Sciences, Tidewater Agricultural Research and Extension Center, Suffolk, Virginia 23437. Summary: Why is all this important to agricultural sustainability? Quality of food in feeding the world is critical to human survival. This involves vitamin, microelement and protein. Water and nutrient efficiency involve crop performance. Water, nutrient efficiency, pharmaceutical work and plastics are equally important to a growing world population. We’ll begin with a brief look at history. We go way back to the Romans and Greeks who brought Pb, S, Hg, and Fe into the world of agriculture. By 1,000 AD, seaweeds appeared in Ireland. N, P, K (manures) appeared on the scene in the 1800s in Rothamsted, England. In late 1800’s Anton de Bary, symbiosis; Carlsberg labs and yeasts in Denmark; and Burgunday/Bordeausx mixes (Cu, S, N, and Ca) in France. In 1909, HaberBosch. By 1934, ethylene bis-di metal dithiocarbamates–Mn, Zn. In the 1930’s, green manures via Rothamsted. Moving on to 1937 we see Florida citrus/nitrates and urea (biuret) in Agriform, California. By the late 50’s, we see the first evaluation of absorption T50 times of multiple nutrients and crops at Michigan State University. Urea grain protein began appearing in the plains. Bugs and extracts were part of the Trichoderma spp by the 1970’s. NPK grains, potatoes, beets, and canola began to appear in the United Kingdom in the 1980’s, as did soil microbes (B) and extracts, stimulants, crop protection, P solubilization, humic/ fulvic acids, hormones and novel compounds. Truism. 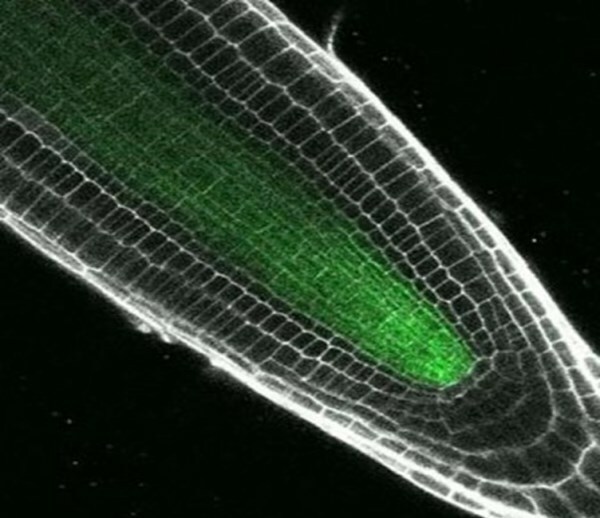 Plants can’t run away so they need to be smart enough to survive in SITU. • Zn/Ca, Ni/Zn, SAR, nutrient solubilization, phylloplane/sphere, rhizoplane/sphere, rhizoplane/ sphere (exudates). • Creating ROI at every level from to dinner plate. Physiology is the science of the function of living systems. 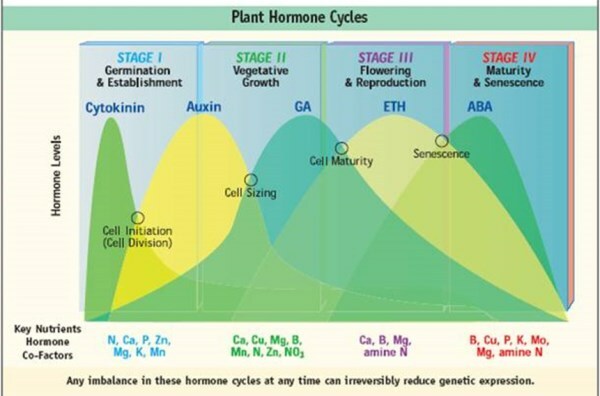 Figure 1 provides a stage by stage look at the Plant Hormone Cycles. Defining Physiology. Physiology is the science of the function of living systems. Physiological tools. We are no longer curing deficiencies, at worst we preempt or override (transient deficiencies). The products and solutions we offer are best considered as physiological tools to assist maximal gene expression. Figure 2: Leaf shape—standard cotton vs. okra cotton. 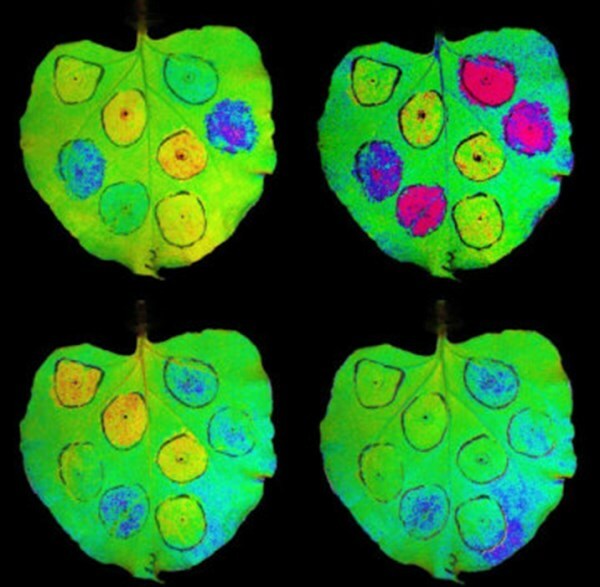 Figure 4: Photosynthetic advances Photo crystals (Figure 3) reflect blue wavelengths but absorb red and green in low light (begonias, forest floor) slowing gap between incoming and reflected light, thus improving photosynthesis. Genes protect against high light intensity damage, switch off to speed up photosynthesis after shade. Plants yield higher with fewer leaves (shade effect). Limits with conventional inputs such as fungicides, insecticides. • Cure-all vs. agronomic proven supplement. Muck and mystery vs. proven solutions. Ignorance at “research” level is a hurdle (disparate disciplines). 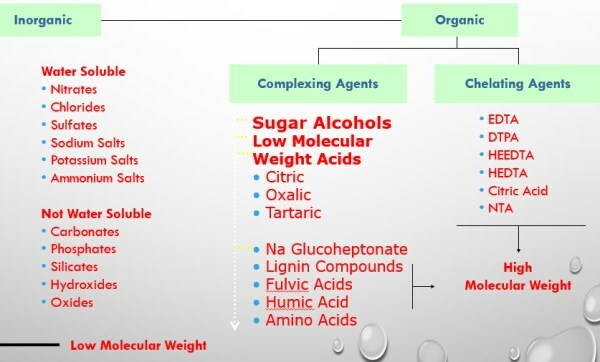 Figure 5 shows all the elements involved in Sugar Alcohols Lowe Weight Acids. • Traits cross below ground (e.g. root architecture and leaf (e.g. life-span, LAI/PAR)—spectral phenotyping. Why is all this important? Agricultural Sustainability? • Human agriculture dated to – 12K years ago, Fijian ants shown to sow seeds and fertilize—3 million years ago. Dr. Julian Smith is a member of the Fluid Fertilizer Foundation Board of Directors and a managing editor on the Fluid Journal magazine’s Editorial Committee. Summary: So, what do we need to watch for? We need to watch for blocking weather patterns to evolve in June, July, and August, as well as troughs to develop in the Gulf of Alaska and north Atlantic in the summer, as these features often lead to hot dry conditions in the Midwest. We also need to watch for cooler ocean temperatures along the West coast of the US and Mexico. The 2017-18 growing season in South America has, for the first time in a few years, seen significant weather issues that have impacted yields. The Brazilian Monsoon was a bit late in getting started at the end of 2017, which slowed planting of the first crop of soybeans. Once the rains got going, regular precipitation and a lack of extreme heat in Brazil throughout the first part of the growing season has led to another large crop. Most estimates have the soybean crop between 113 MMT to 117 MMT, making this either the largest or second largest crop in Brazil’s history. Harvest of the first crop of soybeans is about 10% off last year’s pace, but right in line with the 5-year average. Brazil’s primary safrinha (second) crop is typically corn, but delays in planting and a push to plant more cotton will reduce Brazil’s corn production this year. A weak La Nina played little part in impacting Brazil’s rainfall, but it did have a larger influence in Argentina. Persistent ridging in the jet stream led to a 90-day rainfall deficit that topped 150-200 mm for Cordoba and Buenos Aries provinces, which is about half the normal amount of rainfall for December through March. Soybean and corn yield estimates have been lowered with each report as Argentina’s growing season progresses, and even if rains do return in late March and April, it is too late to save this crop and return yields back toward trend values. Winter 2017-2018 has been a wild ride (as usual) for the US. After repeated bouts of Arctic air in late December and the first three weeks of January, February was quite warm for the east coast while the western states (especially Montana) fell back into below average temperatures. At times, the polar vortex weakened and was displaced over the Northwest, allowing for early summer warmth to move north along the east coast. 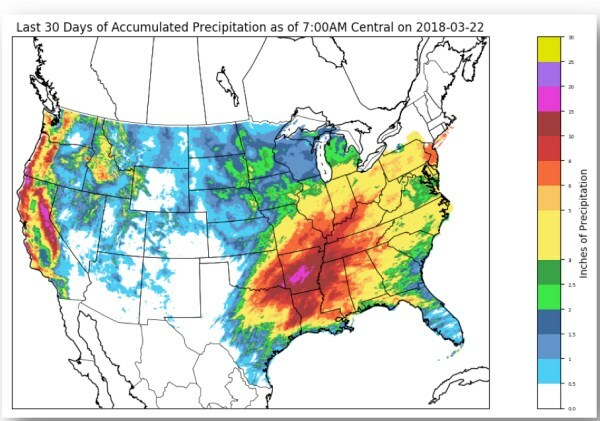 This flow pattern also brought repeated rounds of rain to eastern Texas, eastern Oklahoma, Arkansas, southern Missouri, Tennessee, Kentucky, southern and central Illinois, Indiana and Ohio, which relieved drought in this area but also created a lot of problems with flooding. Rivers in these areas are in flood stage to start March and soil moisture content is very high. This area must be watched carefully through Spring as planting begins because any rainfall over this area will cause planting delays due to nearly saturated soils. Meanwhile the panhandles of Texas, Oklahoma, and southern Kansas have been exceptionally dry. Most of this region has not had precipitation over a quarter of an inch since early October 2017. There are major concerns over the quality of the winter wheat crop as it comes out of dormancy this spring if the drier pattern continues. To end this drought this spring, we will need to see a shift in the jet stream to favor a trough over the 4-corners states. Unfortunately, long range forecasts are not keying in on that pattern evolving through the first half of March, and if it does evolve in April or May, a 4-corners trough means big severe weather outbreaks in the Central Plains. Drier conditions also extend across the coastal southeast in the cotton and peanut belt as well as across eastern Montana and the Dakotas. Remember though, that this region has frozen soil, and the snow cover will melt over the next 45 days, increasing their soil moisture. The mountains out west have above average snow water content in Montana, Idaho, Wyoming, Washington, and parts of Colorado. But in California and Oregon, snow water content is below 75% for most reporting stations. California has been dry during winter, which has allowed drought to creep back into the state over the last two months. When it does precipitate, many locations that burned this past summer are suffering from major mudslides. Spring outlook. April 2018 is forecast to have a very active jet stream (which is good) and it will feature cooler weather for both the east and west coasts to start off the month. Although there will be frequent low-pressure systems crossing the US, the central US is forecast to carry a slight warm and dry bias with wetter conditions on each coast. The forecast for dry weather in the central US has led to a lot of fear that the wheat crop will continue to get worse, but all it takes is a small shift in the jet stream to bring beneficial rain to this area. 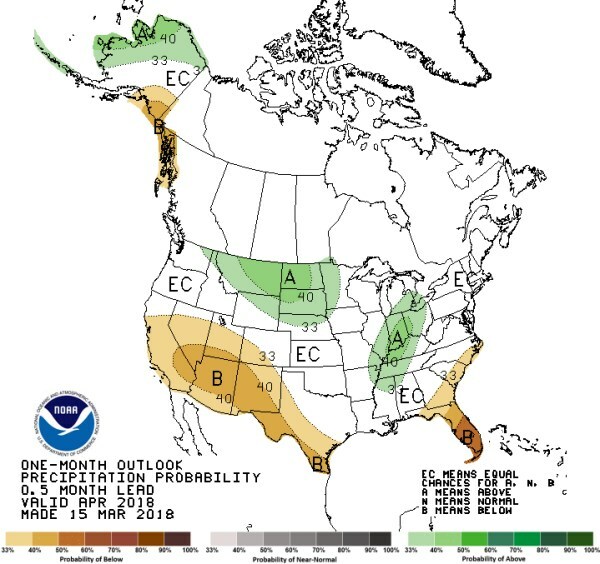 April is typically very wet and stormy at times across the Central Plains, but a forecast for drier conditions for this area is very significant for US corn, soybean, and wheat production. 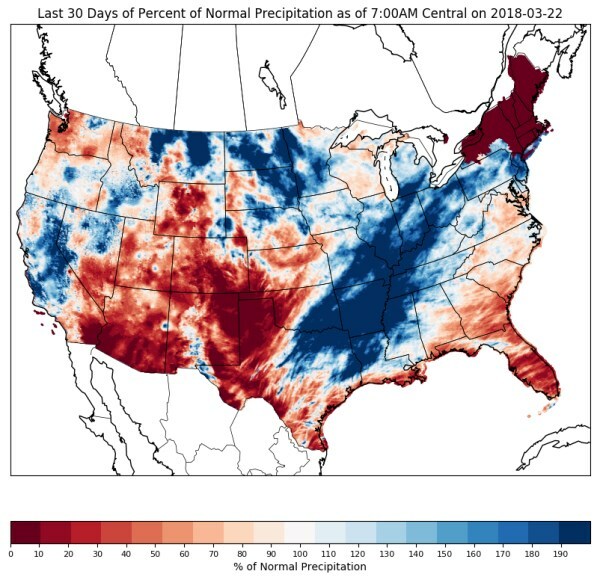 The corn-belt needs to watch this area very closely in the coming weeks, because if the drought survives into late May, it has historically transitioned north and east out of the Plains into the corn-belt. Long-range guidance from the US models and the European model are at odds for March-May in terms of precipitation. The US models are keeping the central Plains warm and dry, while the European model is keeping this same area warm and stormy. The difference is driven by the model’s treatment of features across the Pacific Ocean and North Atlantic. This lack of agreement has a lot of meteorologists focusing more on the short-term fluctuations to see how the pattern sets up for April and May. Please remember, spring rains can easily erase winter drought. In Europe and eastern Russia (Black Sea region), a warm and wet winter transitioned over to bitterly cold temperatures due to a large blocking high pressure system over Greenland at the end of February. A volatile weather pattern is forecast for this area through the first half of March. Summer 2018. There is a lot of worry, which is typical this time of year, about summer heat and drought. Four very good years of high yields have many thinking “we are due” a bad year. 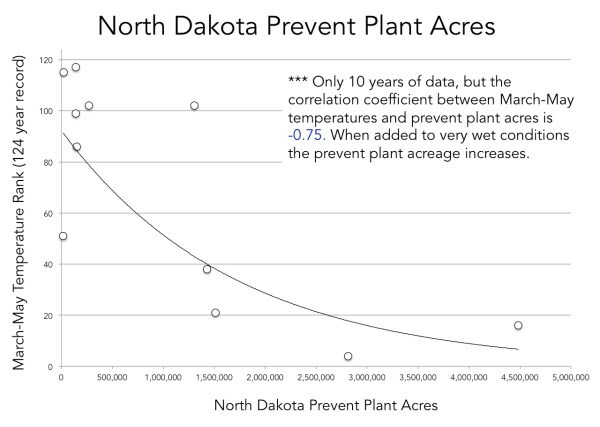 We have to be careful of making these kinds of assumptions as the law of averages does not apply to corn yields, but there is cause for concern. First, guidance from both the European and US models suggest drier summer conditions developing in the central US and Midwest in June. While these models historically have not performed well at 3 to 6 month forecasts, there has been consistency in their predictions, which is cause for concern. It is challenging to find a good analog year for 2018, given how winter has shaped up so far. But with a fading La Nina, drought already established in the central US, plus long-range guidance from the dynamical models pointing toward less than ideal summer growing conditions, there is a lot of discussion about the potential risk for below trend yields this year. Figure 4. 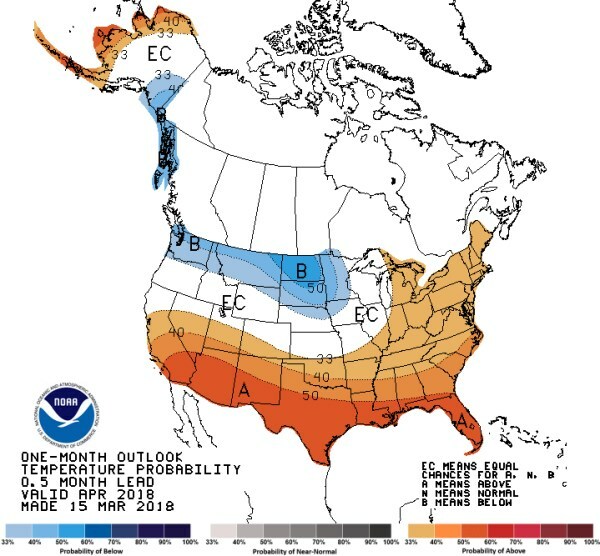 April 2018 Temperature and Precipitation Outlook from NOAA. Figure 6. Last 30 days of temperature anomalies. Source Climate Prediction Center. It is too far out in the forecast to say with any certainty what summer will bring. 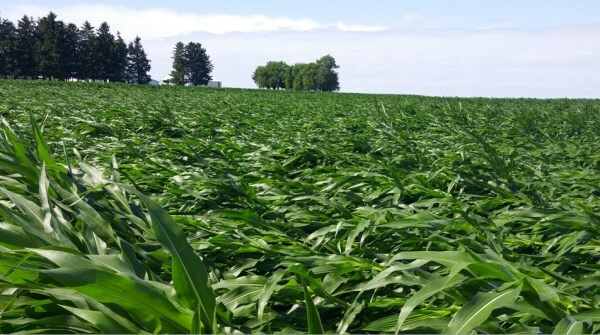 Plus, remember that corn and soybeans are tough plants that require substantial and sustained deviations from normal weather conditions before they show signs of stress. So, what do we need to watch? We need to watch for blocking weather patterns to evolve in June, July, and August. 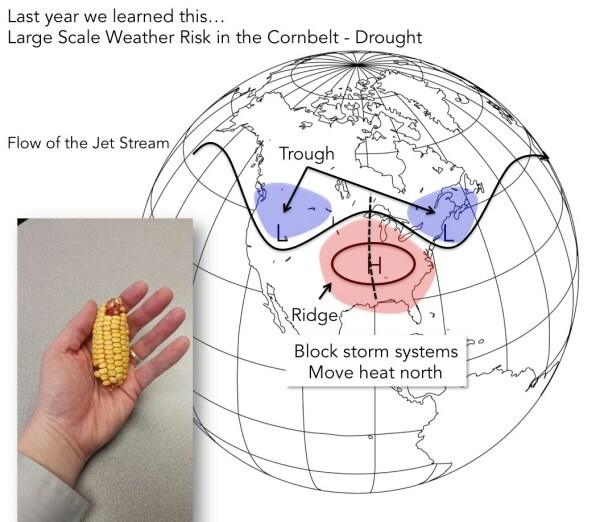 The most common type of block is a ridge in the jet stream and historically the development of a ridge over Iowa, Minnesota, Wisconsin, and Illinois leads to largest negative impacts on corn and soybean yields. Forecasting the position of this weather feature months in advance is impossible. But predicting the evolution of a ridge 10-30 days in advance is possible, and during summer market prices move dramatically on the forecasts of the position of the ridge. Watch for troughs to develop in the Gulf of Alaska and north Atlantic in summer, as these features often lead to hot/dry conditions in the Midwest. We need to also watch for cooler ocean temperatures along the west coast of the US and Mexico, as these are correlated with summer heat in the Midwest. Figure 9. USDA 10-year projections for crop acreage. Source: US Farm Bureau and the USDA. Finally, really warm ocean temperatures in the western Atlantic and Gulf of Mexico, combined with a westward propagating Bermuda High, can signal heat in the corn-belt too. Big trends. US corn and soybean yields have steadily risen for decades as seed technology, herbicides, pesticides, advanced fertilizers, precision planting, and other ag tech has made us more efficient at farming. Trend line yields for corn in 2018 will top 170 bu/acre, and soybeans will near 50 bu/acre. The true potential for both is much higher! 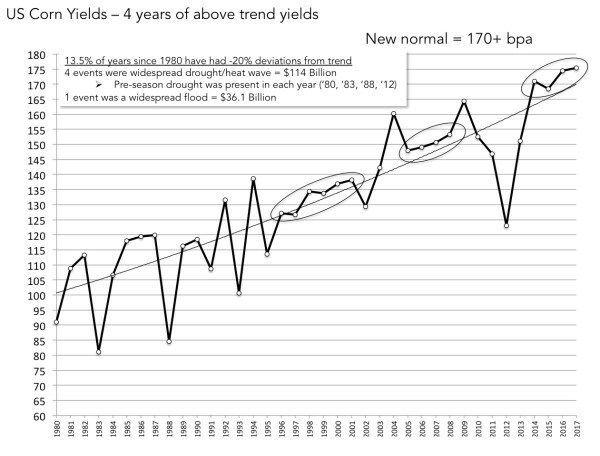 Remove 2012 from those trend lines and the average US yields go over 174 bu/acre and 52 bu/acre, respectively. In addition to this, we are seeing a lot of acreage in the Dakotas converting from other crops (like wheat and barley) to corn and soybeans, which makes the northern Plains a larger part of the US production of both crops. The USDA is projecting that over the next 10 years that soybeans will be the largest US crop in terms of acreage, overtaking corn for the first time since 1983. Dr. Eric Snodgrass is the Director of Undergraduate studies for the Department of Atmospheric Sciences at the University of Illinois at Urbana-Champaign. Dr. Raun Lohry has been named as President of the Fluid Fertilizer Foundation following their annual meeting February 19-20, 2018 in Scottsdale, AZ. He will succeed Dr. Dale Leikam who is stepping down after servings as President of the Foundation for the past 10 years. Dr. Lohry has considerable technical and business management experience in agriculture and the fertilizer industry. After obtaining an MBA in finance he went on to earn a PhD in Crop Physiology from the University of Nebraska. He then served as senior agronomist at Nutra-Flo Co. in Sioux City, Iowa where he was involved in the development of new and innovative products designed to improve crop production efficiency. Dr. Lohry was then appointed Chief Financial Officer for Kay Flo Industries, Inc and President of Nutra-Flo Company. He led Nutra-Flo Company’s Feed Phosphate division and the conventional and PureGrade Products divisions until the Fertilizer portion of Nutra-Flo was sold to the Andersons. He has also served on the Fluid Fertilizer Foundation Board of Directors, it’s Research and Education Committee and has also served as a Chairman of the Editorial Advisory Board for the Fluid Journal. Wow! What a program at the recent Fluid Forum held in Scottsdale this past February. While we sometimes hear that there really isn’t anything new in crop nutrition anymore and that we are often funding ‘more of the same’ research – the research updates presented at the Fluid Forum say otherwise. From research trying to better understand why we now consistently observe potassium responses on soils with potassium soil test levels far above what we previously considered fully adequate – to research delaying part of the overall nitrogen program for application after tasseling for corn. The results of both these research projects fly in the face of conventional wisdom in the not too distant past. In addition, other research updates ranged from topics delving into the intricacies of identifying the interaction of soybean genetic yield gain and the need for supplying additional fertilizer nitrogen – to assessing the potential for drip Irrigation in the timing of nutrient availability for most efficient nutrient utilization. Neither of these research projects are ‘more of the same’ research! The remaining projects and research updates were likewise ‘cutting edge’ and not a repeat of past research. What these projects point out is that the forward looking research funded by the Fluid Fertilizer Foundation is extremely important as all of agriculture continues to face change. Additionally, as the industry continues to embrace the 4R concept of nutrient management – it becomes more and more evident that fluid fertilizers are more often than not the right source once the questions of the right place, right time and right rate are answered. And it also becomes more and more apparent that the research funded by the Fluid Fertilizer Foundation is needed more now than at any time in our industry’s past. At the Fluid Forum this past February, Dr. Paul Fixen with IPNI was asked to review the impact of the past 35 years of our efforts in nutrient management – and to speculate on what is next for our industry. One of the key take home messages I had from his remarks was that we need take credit for all the progress we as an industry have made over the past 35 years, to let everyone know of this remarkable progress and to focus on what we have solved ….. and not on what is not perfect. Too often we focus on the glass being half-empty rather than the fact that that the glass is actually half-full. 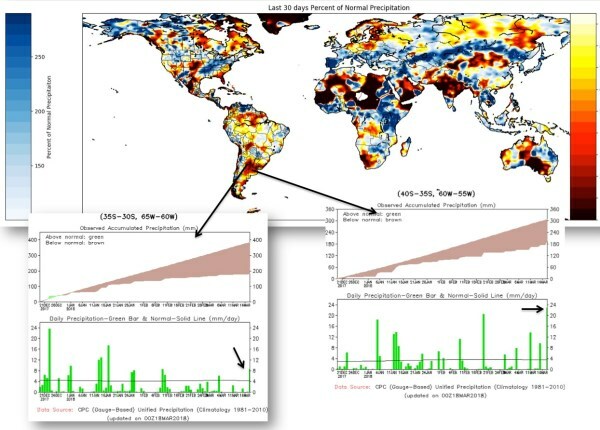 Large, consistent improvements in crop yields, remarkable improvements in nutrient use efficiency and marked reductions in soil erosion are just a few examples of this progress. But too often we compare where we are now in 2017 with what a perfect crop production system might look like – and we find that we are not perfect. Indeed, predicting nutrient management needs for an individual field in an individual year is hard, if not impossible! As we look to the future and develop our plans for meeting future challenges and changes, let’s make sure that we remember that past research such as historically sponsored by the Fluid Fertilizer Foundation has provided the foundation for dealing with the change and opportunities facing all of us today. Likewise, the forward looking research presented at the 2017 Fluid Forum is laying the groundwork for the challenges and opportunities of tomorrow. I can’t hardly wait for the 2018 Fluid Forum! This shift could provide an opportunity for farmers who have had difficulty renting new ground in the past two to four years to expand their operations. Boehlje says farmers interested in expanding their operations should already be thinking about how they want to proceed. Farmers renting new ground should do research on soil fertility levels in their area when they are determining rental bids. As a way to cut costs, the previous operator might have drawn down the soil P and K levels versus building up soil fertility levels – especially if they were uncertain of how long they would be farming the ground. While many farm leases have provisions about soil fertility in them, Kevin Leibold, Iowa State University Extension farm management specialist, says some renters might not be adhering to them. Tim Smith, managing agronomist for Cropsmith based in Monticello, Illinois, says soil nutrient levels in his area have likely been reduced since yields have exceeded their fertilized yield targets. Overall, it is important to focus on trends rather than the absolute numbers in the soil test. For example, if a nutrient is trending downward, he says farmers should discuss the need for corrective management options with their retail agronomist. To help retailers and farmers determine their fertilizer rates on any newly rented land, PotashCorp offers a number of tools and resources such as the Nutrient ROI Calculator 2.0 and a Nutrient Removal Calculator on the eKonomics website. Results from a two-year (mid 1990’s) Kansas State University study at four irrigated sites in Kansas show that late-season application of N to soybeans at the R3 growth stage will increase soybean yields. These results, coupled with similar results in other states, suggested that retail input suppliers, public and private labs and consultants who make fertilizer recommendations should consider N applications on irrigated soybeans with high-yield potential. Six of the eight site-years were responsive and showed an average soybean yield increase of 6.9 bu/A or 11.8 percent with late-season N fertilization. Yields at these six sites ranged from a low of 56 bu/A to a high of 83 bu/A. The researcher concluded that producers of high yielding soybeans (greater than 55 bu/A) would benefit from a late-season application of N at the 20-lb/A rate of N.
Fast forward to 2016 where University of Delaware researchers arrived at very similar conclusions. These researchers found that application of supplemental N may provide a yield benefit for high-yield soybeans, but only in cases where expected yields are 60 to 70 bu/A or higher. In summing up their research, they concluded that Growers are unlikely to see yield increases from late-season (R3) supplemental fertilizer N in situations where yields are not likely to exceed 60 bu/A. In production scenarios where yields are likely to be less than 60 bu/A, application of supplemental N is more likely to result in unnecessary expense and increased environmental impact.